The Samsung Flow app for Android allows seamless and secure content sharing between supported Samsung devices (tablets, wearables) and PCs. Using either Wi-Fi direct or Bluetooth, you can quickly send files back and forth, as well as sync and view notifications from your smartphone on your tablet or PC. 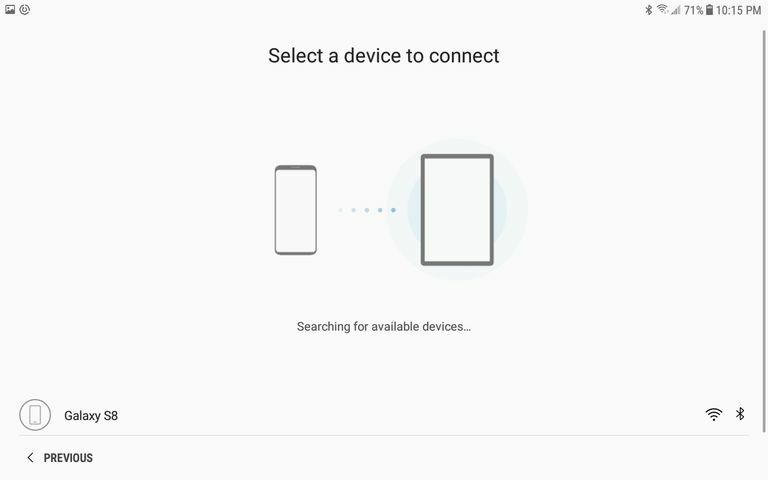 The app offers a hotspot option that allows you to use your smartphone as a network access point, so your tablet or PC remains connected, even when it can't access the internet. If you frequently move files between your devices or switch from your smartphone to your tablet/PC, Samsung Flow is an excellent tool to keep everything connected, organized, and accessible. Download the Flow app for free from the Play Store. If you plan on connecting your smartphone to your window 10 PC, download the Samsung Flow via the Microsoft App store. Samsung Flow supports Android-based phones and tablets, running Marshmallow or higher, and PCs with Windows 10 Creators Update or higher. Once Samsung Flow is installed, and you've paired another tablet or PC, you can begin to share content between devices. Tap the paperclip icon in the lower left corner. Navigate to a folder, select the files you wish to share, then tap DONE. Once you've shared the file, it will appear under Flow History on both devices. Key Features: To send messages to your connected devices with the Flow app, tap inside the text box, type a message, then tap SHARE. By default, all your apps are selected to send notifications to connected devices. However, you have the option to choose certain apps or none at all. Tap the vertical ellipse menu in the top right corner, then tap Settings. Tap the switch next to an app to enable/disable it from sending notifications to your connected devices. Once you've connected a device with Samsung Flow, it automatically registers it for quick future access. You can rename, deregister, and select an authentication method via Flow's settings. Tap the vertical ellipse menu in the upper right corner, then tap Manage devices. Here you can remove or rename the device, as well as select one of the two authentication methods. After installation, the app creates a folder called Samsung Flow in the root of your device's internal storage and is where all your shared files get stored. You can choose a new save location, or create a new folder via the app's settings. From Settings, tap Save received items in. Navigate to a different folder and tap Done, or, tap Create folder. Name your folder, then tap Create.